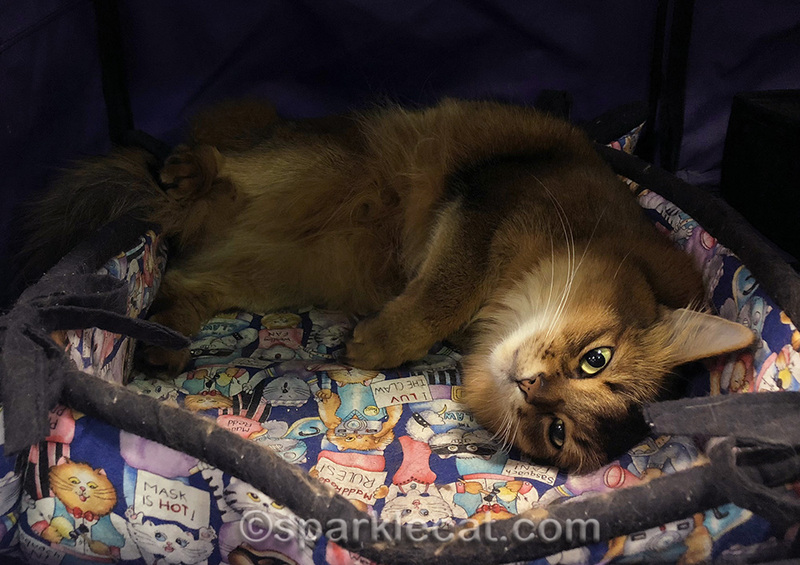 I had a fun time at the cat show, meeting and greeting all my friends and fans! This is one of many I come to every year. 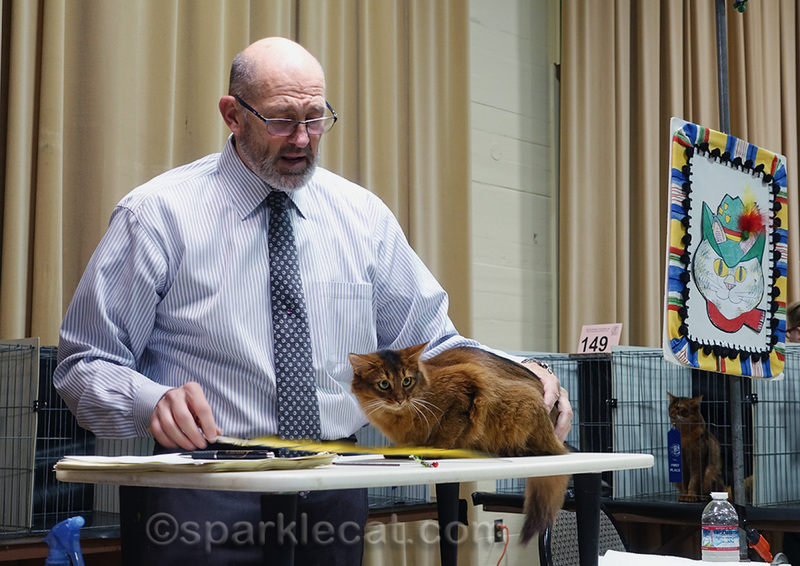 It was my first show I competed in as an adult in 2014, and I’ve competed several times in their Cats In Hats competition (more on that later). But I’m glad I’m a Pet Me Cat now and I don’t have to be shuttled from ring to ring. I did have two relatives here, however, who were in competition. And even though they are brother and sister, they are at two completely different places in their lives. 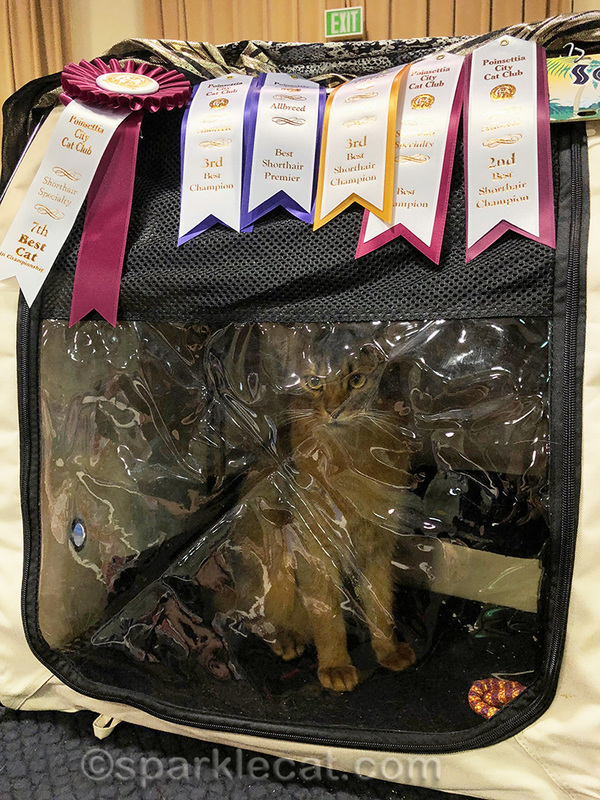 This is Cara, and this show was her first ever, even though she is in the adult class. Her grandmother is my mom. 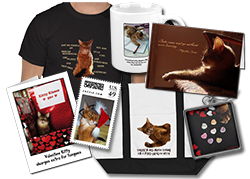 Cats graduate into the adult cat class when they are 8 months old, and that is exactly how old she is. Cara’s brother, Obie, on the other hand, is an old pro, even though he is the same age as her. 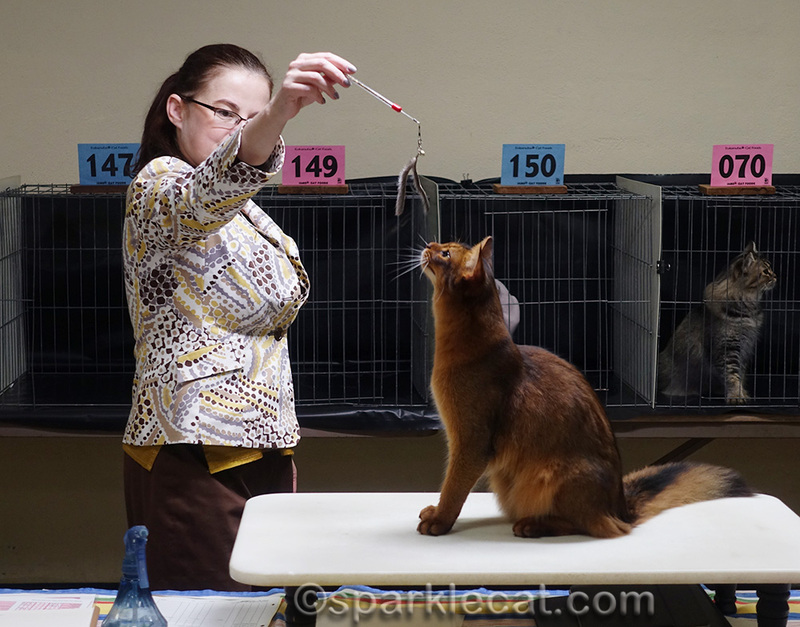 This was also Obie’s first adult show in CFA, but he has been competing since he was four months old. His shows as a kitten have taken him to a couple of different continents! 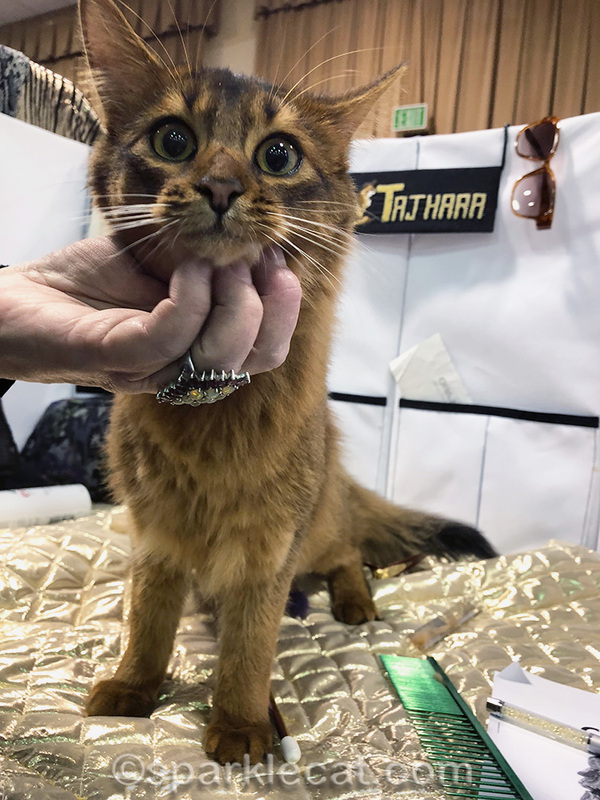 He’s a very good-looking and special kitty, which is why he has traveled so far to shows. He’s an international quality Somali cat. Cara was competing in this show mainly because she will have to travel internationally to her new home in March. So she needs to get out a little bit. While she is a gorgeous cat in her own right, not all pedigreed cats have to be show cats. She just needs a little practice to be ready to travel. 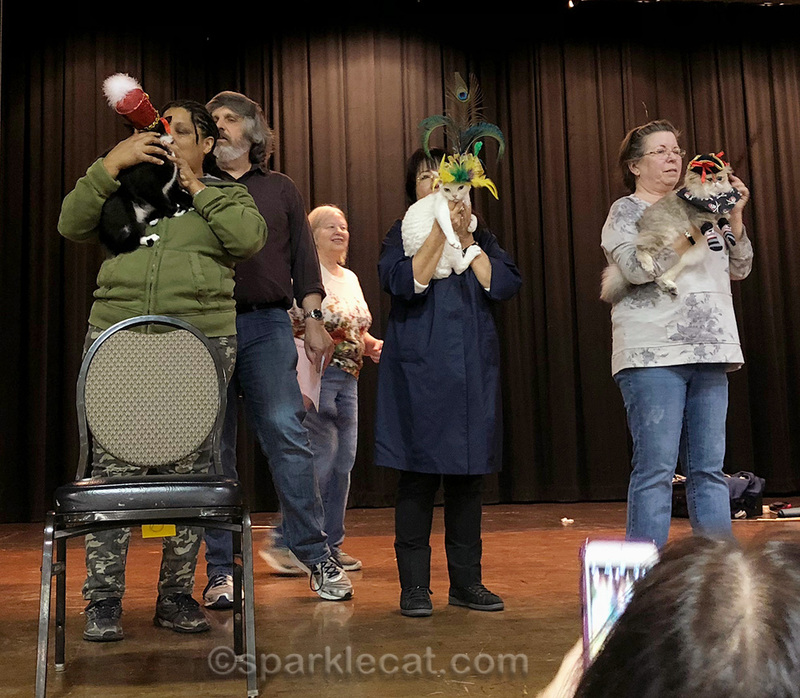 My human handled her for this show. She was a bit shy and uncertain of herself at first, but she wasn’t scared. By the end of the day, Cara’s tail was up instead of down… and she had decided that my human was her new friend! Obie, meanwhile, handled each ring like the pro that he is. And he did very well for his first show as an adult! He is already more than halfway to earning his Grand title. Cara picked up a few points too, because there were three adult Somalis competing, and she came in second in five of the six rings. While these two were busy in the rings, I entertained people. My breeder found some Halloween items at a deep discount at CVS, and picked up some things for me. One was this costume. The head part was a little big, though. Make that a lot too big! I didn’t compete in the Cats In Hats competition this year — my human was too preoccupied to put together something for me. So she got to watch the competition as a spectator, and cheer on her favorites. 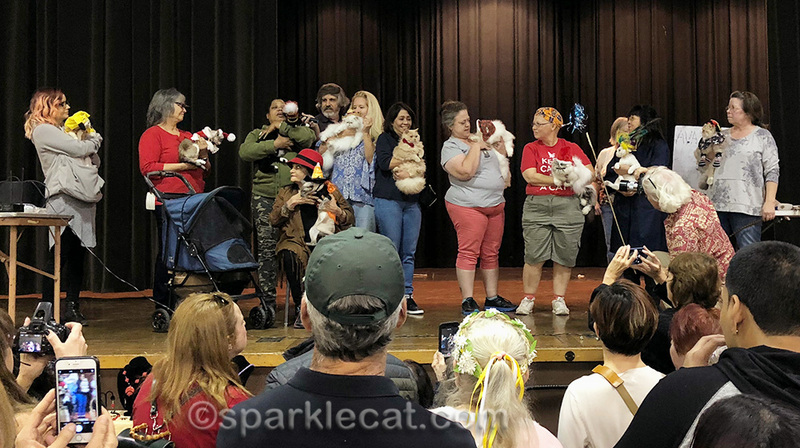 And it turned out her favorite — the white Devon Rex in the middle — won Best! 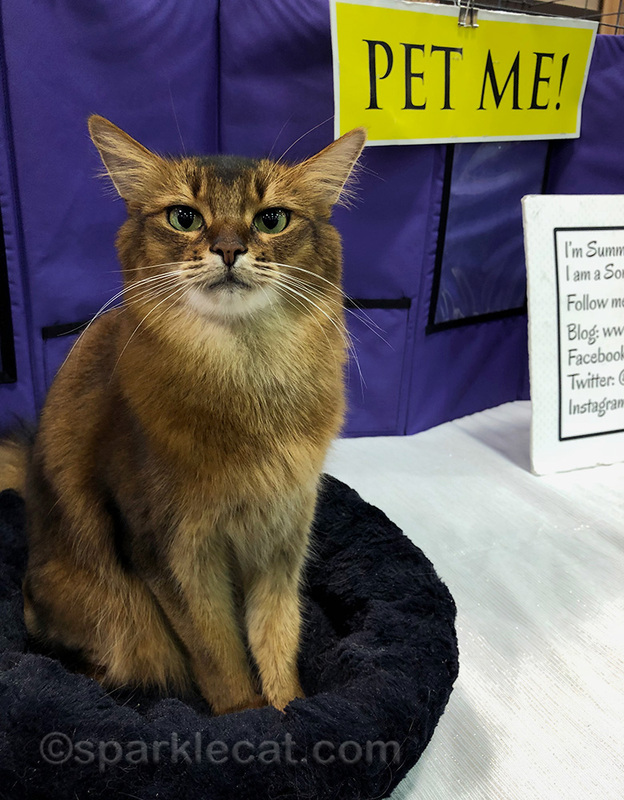 I had lots of time to rest while my human was taking Cara to rings, so I was mostly up and ready to meet people when she was sitting with me. I had a great time! 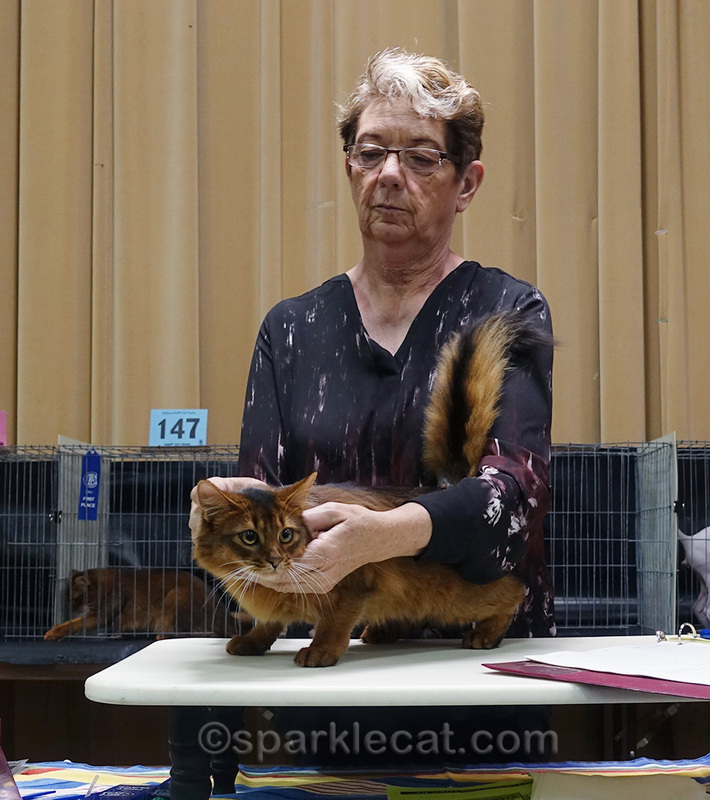 Merilee is one of Plushâ€™s favorite judges even though he doesnâ€™t always make her hhp finals. Wow, Obie did very well! Good for him. And Cara is on her way to becoming a repeat winner, too! That pumpkin hat looked like it was trying to swallow up your face a little bit, but you are still so cute no matter what, sweets! You are all such beautiful cats! FUN! Cara is a cutie – those eyes are wonderful……she will get the hang of things before you know it. Obi sounds like he’s going to have quite a life with lots of travel. You look like you had a FUN time with that pumpkin suit! Does your breeder think you have a big head? MOL! Bet those other cats with hats were glad you didn’t compete so they’d have a chance. Cara is very pretty like you. Cara is such a beauty! And I’m so glad the Devon won the hat competition…what fun! Cara certainly is a Pretty Cat!! I’ve known some very pretty human women named “Cara,” so that’s a good association. She’s like a cat version of them! And, with your eyes closed too, as all cats look cute when they sleep! Cara can sit on my lap, purr, and knead me anytime! I am glad that you and your human both had a fun time at the show. the show ring. It’s a good looking family you have. What a great event! Does that mean Cara is your niece? We have trouble keeping up with your family tree. I think? At this point, I’m not sure! The further away they get from my parents, the more confusing it gets. Hats on cats! 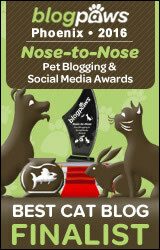 Well, what a fun contest! Cara is beautiful! You’re adorable! We’re glad everyone had a great show! Oh my dear, that last photo is utterly charming! Summer, I always like reading that you had a great time. I like to see how your relatives are doing too. That sounds like such a fun time for everyone sweet Summer! What a fun time, Summer. We liked the cats in hats. A Cats in Hats competition sounds like a lot of fun! We wish we could have seen the winner closer up. As always, your relatives are awesome, but you will always be our favourite girl, Summer! Care ia pretty cute and congrats to Obie! Bet you like going to the shows and just have lots of fun.